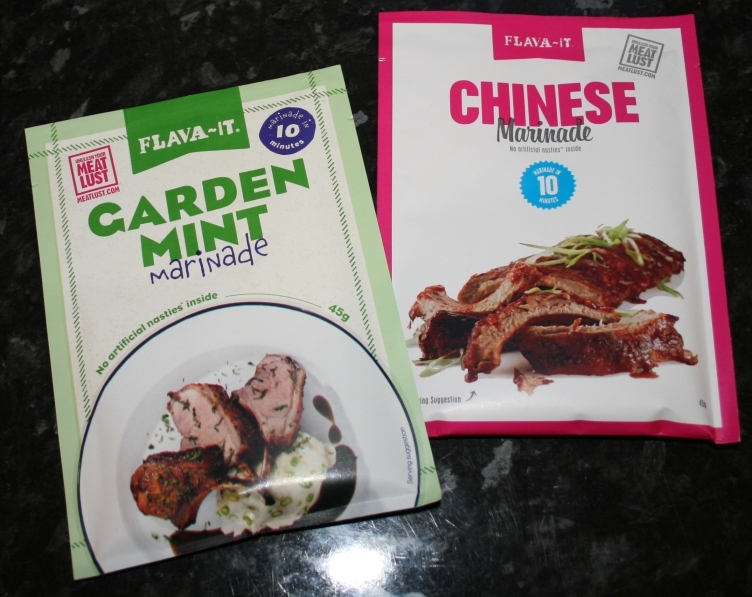 Today is the day of the review I have been looking forward to, because I personally am a huge fan of FLAVA-IT marinades. In particular I use the Chinese style and Garden Mint varieties most, probably around 3 times per week or more!! Bought from stores such as Morrisons the marinade comes in a small envelope like packet as shown, they do more flavours, such as Spicy BBQ and others, but these two (seen above) are by far my most commonly used. Step one is to prepare your meat. 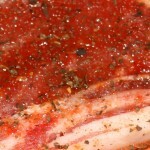 Below you can see that I use the Chinese marinade on the Belly Pork and naturally the Mint flavour on the Lamb chops. A quick bit of a trick here – sprinkle the powder onto a large plate spreading it evenly and place the meat on top of it, then, sprinkle some over the top of the chops or whatever you are going to cook. This allows the marinade to become moist and sink into the meat evenly and quickly. 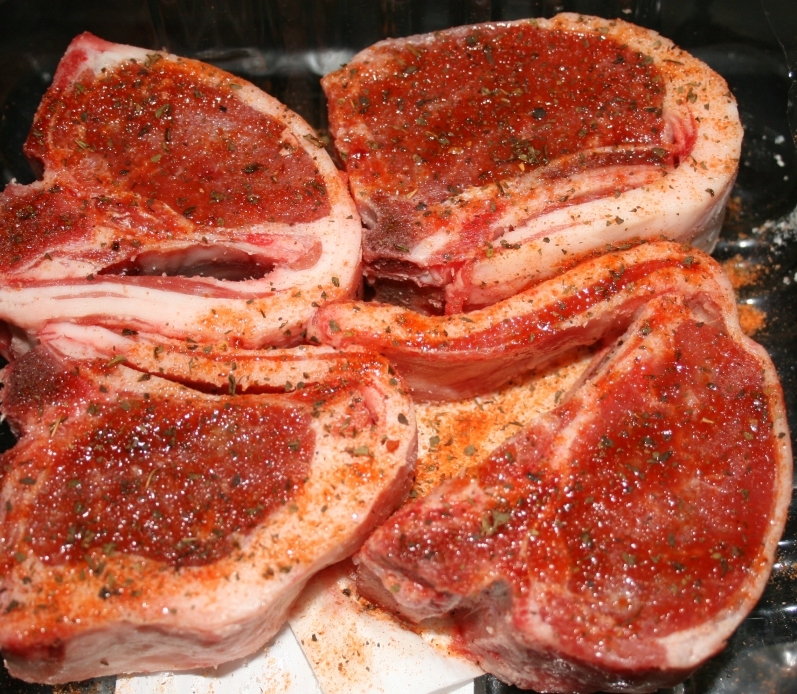 In the pictures, I just sprinkled it on and then turned the chops over before coating the other side – but my preference is normally to apply it as described on a plate. It takes around 10 minutes to soak up the moisture and begin flavouring the meat. The amount you put on is purely up to your own preference, however I would say that sparingly is the key here because if you are grilling, the tendency is to burn the marinade before the meat is thoroughly cooked through (giving it a blackened effect as it burns). Try and avoid putting too much on in one area aswell, or allowing the powder to gather in one place. This creates a burned patch aswell if you aren’t careful. Spread as evenly as possible in summary – with as much as you prefer. Once you are satisfied that the marinade has done its job of adding flavour to the meat by penetrating and infusing the particular taste, (this make take hours, but if you are cooking it immediately then you will still get a great taste anyway as it stays on the surface) , you may wish to wipe away any pooled surplus (again to avoid blackening). I am generally in a hurry to start cooking and don’t always have much time to allow the flava-it to sink in – so for me – my chops look like these just before cooking – you can see that the powder has liquified. These lamb chops are now ready to grill to your liking. Now I would say that every packet comes with enough marinade to do around 20 chops as above – but once again, how much you use per serving is purely up to you and your taste buds! The next favourite of mine is the Chinese flavour and I use this on pork ribs and belly pork – I really don’t have a preference as to which – although both are grilled and both require about the same amount of flava-it coating to provide the great taste. Here’s a shot of the pork with the Chinese style ready to go under the grill – some people prefer to place these in the oven. The pork tends to take around 40 mins of grilling on a high temperature and turning over during the process, whereas the lamb is a bit quicker at around 25 mins all done. I strongly recommend serving either of the above with fries and the hottest chili sauce you can get your hands on, and a couple of onion rings thrown into the recipe does it no harm either. I have never come across such a handy cooking flavour as Flava-it, and priced normally around the £1 mark it is worth every single penny in my opinion.